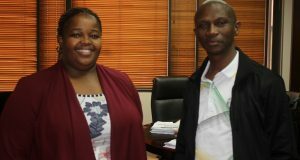 Deputy President of the Republic of South and African National Congress, Cyril Ramaphosa flanked by ANC deputy provincial chairperson, Violet Siwela (left) and Cosatu's First deputy president, James Tyotyo (right). Nkomazi – The Congress of South African Trade Unions says that there would be no need for government to build a house for deputy president Cyril Ramaphosa when he becomes president. In a thinly veiled reference to the R250m that the South African government paid toward the construction of President Jacob Zuma’s house at Nkandla, Cosatu’s first deputy president, James Tyotyo, reiterated the trade union federation’s support for Ramaphosa to succeed Zuma as president of the African National Congress and the country. “He will not steal government money. Government will not build him a house, because he already has his own house. As Cosatu, we want to repeat it today, we say the president [Zuma] must step down, because on daily basis he commits blunders. His blunders will make us lose the elections in 2019,” said Tyotyo. He was addressing thousands of Cosatu supporters who participated at Mpumalanga Cosatu’s May Day rally held at Hectorspruit. 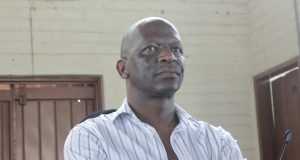 The rally was held at the gates of Umbhaba Estate, where 242 workers were dismissed after participating in a strike for the recognition of their trade union in November 2015. Tyotyo said trade union federation has already taken a resolution that Zuma should step down and called on ANC delegates who would be attending the ANC’s national conference in December this year to follow suit. “We as Cosatu said that at the next ANC national conference, delegates should not be confused: ‘Here’s the deputy president of the ANC [Ramaphosa]. He is the one who is supposed to take over and be the ANC president and consequently the president of the country,'” said Tyotyo. 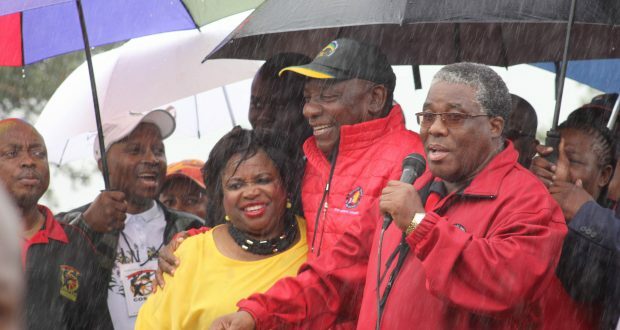 Ramaphosa delivered his speech amid a heavy downpour, but the marchers stayed on and listened for the entire speech. He narrated the history of May Day in South Africa, and said that the recognition of the day as a holiday was a result of persistent struggle. “May Day is your day. We fought in the 1980s for the recognition of May Day as a holiday. The then government was adamant. They didn’t want the workers to have their own holiday called May Day. They vowed that we would not get it, but today we have it because we defeated them and showed them that workers have the power,” he said. Ramaphosa steered away of the ANC’s succession debate and called for unity in the ANC alliance. “What we need in South Africa is unity because the political situation is not well. The ANC is facing a lot of challenges. We say ANC, SACP, Cosatu and Sanco must unite so that we can bring change in South Africa so that we can have rights and radical economic transformation,” he said. He repeated his now usual line about corruption. He said that those who work in government should be honest people. “Government must work in the right way: Those in government should not steal money; those in government must work with integrity. Whatever they do, they should put the people first and themselves in the rear. 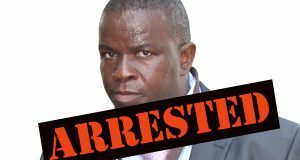 They should not go to work to steal money,” he said to loud cheers. 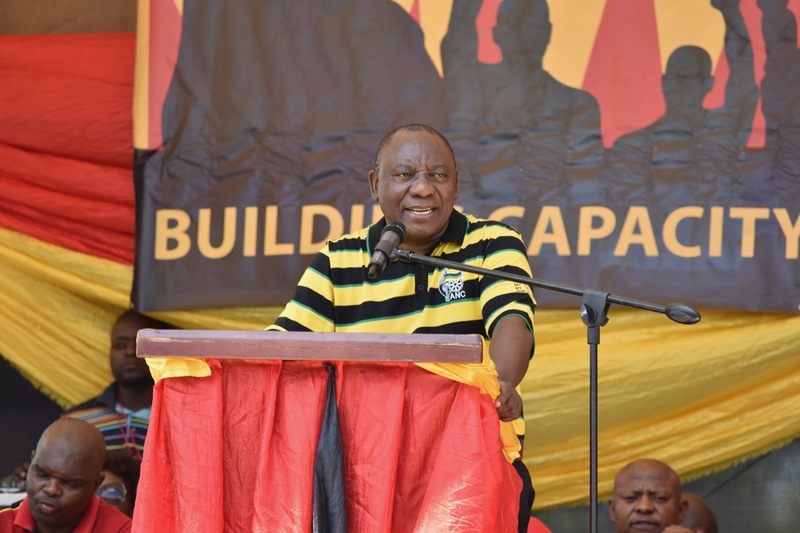 Ramaphosa also promised the marchers that he would engage with the owners of Umbhaba Estate and warn them that their actions were in contravention of the country’s labour laws. Umbhaba Estate managing director, Roy Plath, had previously vowed that the workers who participated in the strike in support of their demand for the recognition of their trade union would not be reinstated because they had been involved in criminal activities during the strike. “It has to be clear to our company that when people break the law, cause huge damage to the company, and the relationship has [collapsed]… they must go in peace and find another job,” said Plath in 2016.